Just in case you haven't gotten tired of smacking birds and pigs together (who would, really? 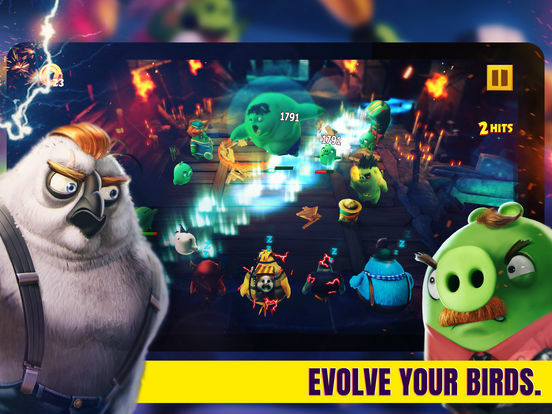 ), Angry Birds Evolution is here to give you more of what you crave. Only now it's viewed from a top-down perspective, is in 3D, and plays more like air hockey or pinball. Not exactly an 'evolution,' but not a bad change, either. Teaming up is for the birds. Seriously, you'll want to constantly beef up your team of birds. Diversify your team. Each bird color (Red, Yellow, Blue, etc) has its own type of special attack. You don't necessarily need to include one of everybody, but having more than one type of special move available can be a big help. Different birds have different specials. Each bird color has a sort of generalized special attack, but there are small differences between them. For example, all white birds will fire off a damaging blast in a straight line that can hit multiple pigs, but one may leave an area of effect on the ground that deals damage each turn while another creates a slick surface you can use to keep your other birds moving for longer. Level up your favorites. 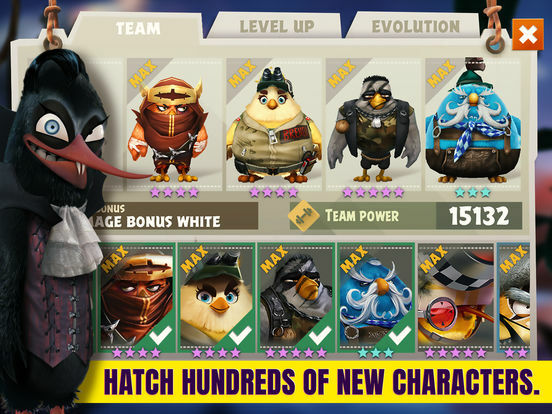 If you find a bird you like (preferably one with more than a one-star rating), you can use unwanted birds and some coins to increase their level. More levels means more power, and if you can get them to their maximum level you can evolve them into even more powerful forms. Shiny birds offer more xp. If you manage to find or hatch a bird that has a bit of a bluish sheen to it, that bird is shiny and will give you more experience point if you use it while leveling-up. Go on adventures. Sometimes you'll find adventures on the map (the clock icon). By assigning birds to those adventures, you can earn more coins or even gems (i.e. premium currency). The best part is you can still take on pigs using birds that are on adventures - the only thing you can't do is sell them or use them for leveling-up others. It's possible to brute force your way through most levels if your team is strong enough, but with the right technique you can come out on top even when the odds are stacked against you. Aim for the back. Hitting a pig from any angle will cause damage, but hitting them from behind will cause more. This is especially important to remember when you're up against very large, hearty pigs. You can cancel shots. If for whatever reason you decide not to use the bird you're currently aiming with, drag your finger back to the bird to make the trajectory arrow go away and cancel the shot. Tap on pigs to see their info. If you're unsure which pigs to prioritize, you can tap them to see how much health and attack power they have. While Angry Birds Evolution isn't a huge departure for the series, it isn't a failed experiment. It does fall into a few of the same bad habits of other freemium games, but overall it's a fun - if simple - time. While the core gameplay of Angry Birds Evolution is somewhat similar to the earlier games, the game does stand out quite a bit thanks to its visuals. The 3D models look great and the animations are certainly nice, but for me the big selling point is how varied the bird designs are. While they're still broken up into different types by color, and color denotes their special abilities, there's an impressive amount of visual distinctiveness even between birds of a feather, so to speak. One red bird might be a very small, round, wild-eyed fellow while another red bird is much taller, thinner, and mellow-looking. There are some minor differences between the birds' stats, too. The perspective change manages to preserve the fun, thankfully. Now, instead of launching birds at pigs in fortified locations via a slingshot, you've got to knock them into pigs like a pinball. A well-placed shot will cause your bird to ricochet all over the place- causing all sorts of damage, pushing targets into new positions, and possibly wrecking parts of the environment that the piggies might be hiding behind. Being able to use the various birds' special abilities to further manipulate the field or cause damage to multiple pigs at the same time is also pretty darn satisfying, especially if you manage to group them together just right. Interruptions are an oddly common problem, though. Like, I get it. This is a free game with a fair number of moving parts that all need to be explained properly. Doesn't mean I have to like it when a game falls into the familiar pattern of tossing up un-skippable tutorial messages or forces me to check out a specific menu option that I already understand due to playing any other freemium game before in my life ever. Either not interrupting me constantly or giving me the option to skip over all the obvious and repetitive stuff would have been super. I also can't shake the feeling of having played several games like this before. 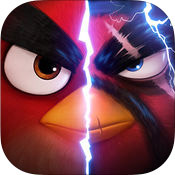 Granted, Angry Birds Evolution certainly looks nice and the various special moves are fun to pull off, but that stuff is more cosmetic than anything. I still think it's fun, of course. It's just... familiar. Which could be a problem if you play games like this more often than I do. As I've said probably way too much at this point, Angry Birds Evolution isn't really an evolution. It's a bit of a departure from the earlier games that launched an empire, but it's something we've seen before (without birds) and not all that different from the other Angry Birds that came before it. Plus there's all the annoying interruptions that don't let up for a good long while. Still, there's no denying the mindless fun of smacking pigs around with birds, or lining up a perfect special attack that takes out multiple targets at the same time.